Posted on July 14, 2017 by Matthew Leib. This entry was posted in Faculty Friday, Life Events and Changes, Spotlight and tagged Faculty Friday, Spotlight. Bookmark the permalink. As humans, we leave little room for tragedy in our lives. When tragic events do occur—invading the idyll of the everyday and shattering our confidence in common bonds—we all too often attempt to cope by burying associated memories deep beyond reach: suffering stifled, pain pent up, and the confusion sown by death, disease, and mental illness cloistered far from casual conversation. It’s a collective conversation many, including Stuber, who lost her husband to suicide in 2011, would argue has been a long time coming and is now more necessary than ever. A 2016 federal study reported a nationwide increase in suicides in all age groups, save for older adults—the highest overall rate in three decades. “One of the reasons it’s increasing is that we have all these cultural shifts driving disconnection, some of which create opportunities to treat each other very poorly,” Stuber says, adding that we also know suicide is impacted by the state of the economy and criminal justice involvement, among other factors. One way to begin is by grappling with suicide’s statistical scope. 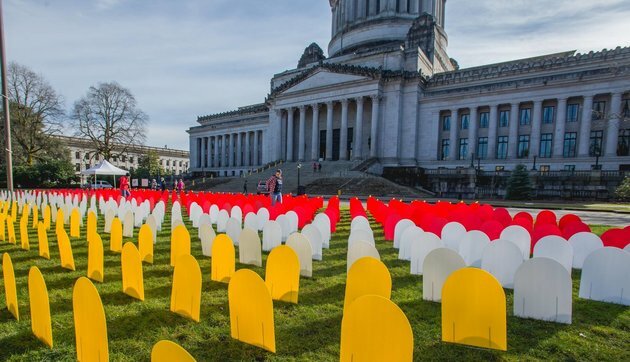 In 2016, Washington lost more than 1,100 residents to suicide, a figure 16% higher than the national average of 13 deaths per 100,000 people. On average, one person in the state dies by suicide every 8 hours. At particular risk: military veterans, Native Americans, and the middle aged. Another way of quantifying the problem: about six times as many people die by suicide in Washington annually as by homicide; nearly 80 percent of firearm deaths in Washington state are suicides. In Washington, suicide is the second leading cause of death among people aged 10 to 25. It’s a problem big enough to call for broad-based solutions, but also one Stuber says still doesn’t get its due. Enter Forefront. The center’s approach to suicide prevention encompasses policy change, professional training, campus- and school-based interventions, media outreach, and support for persons affected by suicide. In large part due to Stuber’s efforts and advocacy, Washington became the first state in the nation to require that mental health professionals receive training in suicide assessment, treatment and management when the state passed the Matt Adler Suicide Assessment, Treatment and Management Act of 2012, named after her late husband. Subsequent legislation followed, requiring that all doctors, nurses, physician assistants, and all other health care providers, including pharmacists and dentists, receive training to support at-risk patients. While other systemic measures aimed at suicide prevention, such as continuity of care for those who are at-risk, have yet to be brought to the table, Stuber says she believes that expanding the state’s health services’ knowledge base in this way will bear positive results. In 2016, Stuber worked in conjunction with state Rep. Tina Orwall to form a working group that included gun rights advocates, public-health experts, and individuals who have been affected by suicide. In the process, she learned that groups such as the Second Amendment Foundation and the National Rifle Association were more than willing to contribute to preventative measures once the stigma surrounding suicide’s preventability was broken down. A resulting bill, signed into law by Governor Jay Inslee in March 2016, calls for developing suicide prevention messages and training for gun dealers, shooting ranges, gun shows, pharmacies and drugstores to pair suicide prevention and gun safety education with the distribution of storage devices and medication disposal kits. Stuber finds herself in the rare position of academic and advocate, front-loading her teaching at the UW to fall quarter, while spending much of her winter in Olympia shedding light on the issue of suicide prevention and sharing ideas with the state legislature on how best to ameliorate the situation. The balance of the year she spends in her capacity as Forefront’s faculty director, crafting communications, catching up on writing publications, as well as coordinating work to create tailored curricula for the healthcare providers whose training the laws impact. The ultimate goal: substantially reduce the suicide rate in Washington. “We should see a relative decline in suicide rates in Washington in the next five years from the number of professionals we are training,” Stuber says. It’s a heady undertaking. To date, Stuber and Forefront have helped pass six laws related to suicide prevention in Washington state. In the process, she also partnered with the Pharmacy Association, UW Pharmacy, and WSU Pharmacy to develop the first curriculum ever written on suicide prevention for and by pharmacists. Additionally, she’s worked to build a curriculum through UW Psychiatry, the AIMS Center, and UW Department of Family Medicine called All Patients Safe. “We’re working really hard to build curricula that is responsive to their practice settings and professional contexts,” Stuber says of efforts to provide training, most of which will be implemented online. “You want something that’s truly interactive, but also something that pushes peoples’ learning and comfort level. Stuber stresses it’s imperative that healthcare providers get comfortable with the basic skills such interactions and interventions demand. Her work permeates non-professional areas of the UW campus as well, with a special focus on students. Stuber says the University’s willingness to engage on the issue has been “heartening” and that it has led to real, impactful outcomes, such as increased staffing at the counseling center, training of faculty and staff, and interactions with departments across campus to examine actions they can take within their own control to make campus a safer place overall. This past spring, the student group Huskies for Suicide Prevention Awareness held its annual walk to raise money for students to get peer-to-peer training. It’s all part of a broader four-year collaboration aimed at promoting mental health and preventing suicide at colleges and universities around the state. Operating in a space that simultaneously touches arenas of government, media, education, and healthcare, Stuber says her work can feel “backbreaking” at times. At one point, after the initial law requiring training for healthcare providers passed in 2012, she says she momentarily considered taking a step back. 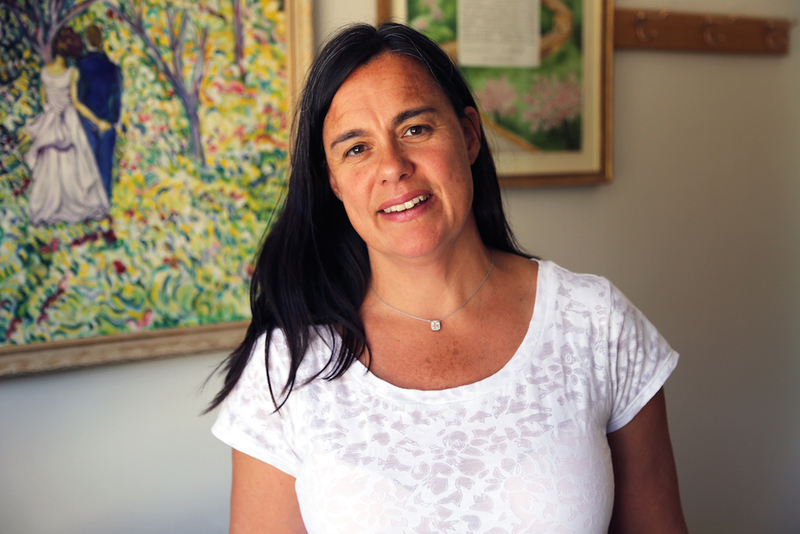 “For many people, when you have an opportunity to do something about a tragedy in your personal life as well as a social good, it’s really compelling as a way to heal,” she says, adding that helping people engage with others who are directly affected by the issue also has the positive effect of counteracting the tendency to withdraw into sadness. “We help them use their stories to help drive change,” she says, in reference to the fact that all the trainings Forefront provides are informed by real people whose stories offer insight as to how to approach prevention. For her part, Stuber says she doesn’t tell her late husband’s story that much anymore. Stuber was already studying the stigmatization of mental illness and teaching courses on mental health policy and systems change in the years prior to her husband’s death. “I basically just integrated my life,” she says. Stuber’s 12-year-old son, Jake, stops by her office at the School of Social Work for a lift to soccer practice. It’s a portrait of resiliency and drive reflected on her office walls, where, alongside framed photos of legislative triumphs she’s shared with her young son and daughter, hangs her ketubah, a type of Jewish nuptial agreement illuminated in watercolor, and a vivid impressionistic painting her twin brother created for her wedding. For one who has been so public in her discussion of suicide and its impact on her own life, Stuber says there is one thing many people don’t realize about her. Jennifer Stuber holds a B.S. in Biology from Cornell University, a Ph.D. in Health Policy and Management from Yale University, and was a Robert Wood Johnson Health and Society Scholar at Columbia University. Learn more about Forefront here.